versiondog is the leading version control and data management software solution for industrial automation. versiondog brings order and clarity where project data needs to be continually changed and made available from a central source. The increased safety, security and certainty provided by this software system quickly results in measurably increased productivity. 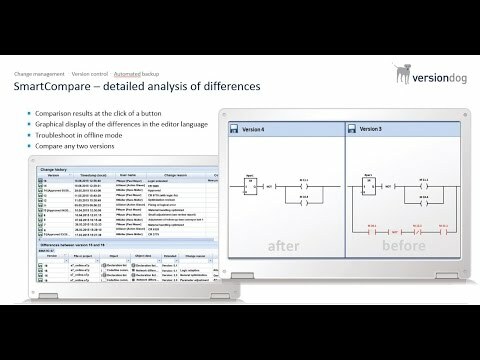 versiondog makes it easy for you to optimise the interplay between all your different types of robots, controllers, field devices, drives, programming languages, file formats and software applications. This data management system gives you ultimate data traceability, minimising your risks and costs, and saving you time and effort. versiondog is the manufacturer-independent solution for robust version control and data management in industrial automation. With the dawn of Industry 4.0, the level of automation involved in production is constantly increasing. versiondog users can automatically back up their device data, create versions of software development stages and track changes via a change history (version control and change management). In concrete terms, versiondog supports control units such as PLCs, CNCs, SCADA systems, HMIs and drives, as well as various file formats and documents. The data management system provides the complete package of change management, version control and data backup. This allows users to protect, back up and store data from programmable devices and documents while also detecting and tracking all changes made to project data. Because it is not tied to a single manufacturer, versiondog can provide the widest range of support for automation systems on the market. 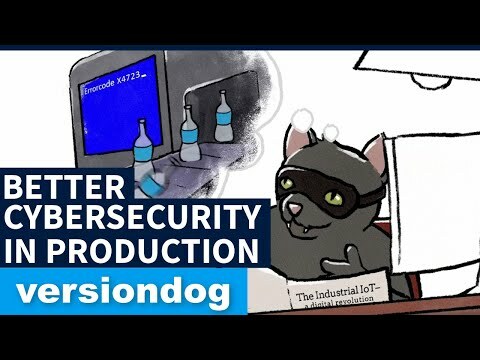 By developing interfaces for new devices and integrating new versions of devices that were previously supported, versiondog is constantly improving its device integration. A truly all-in-one solution for an entire production facility, versiondog maximises productivity, minimises downtime and provides an extra level of assurance by enabling fast disaster recovery. The software is currently unique on the market. versiondog is used in all areas of automated production across many different industries (automotive, supply, food & beverage, chemical & pharmaceutical, public buildings etc.). Get notified when Auvesy releases new IoT software.